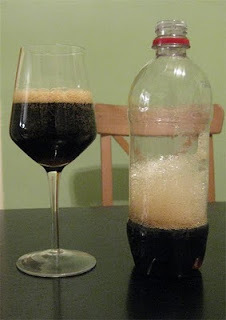 When I have a great commercial beer it often inspires me to come up with a recipe along the same lines to brew, usually with some tweaks to make the beer more to my tastes When tried my first bottle of Lost Abbey's Angel's Share, I set out to brew something similar the result was a massive liquor infused barleywine. My general idea was to get a relatively dry, dark barleywine that was infused with a big spirit character. What I didn't intend was to mimic the lack of carbonation in the 2007 Brandy Barrel version of Angel's Share. I brewed my batch nearly two years ago, but since then the high alcohol content has defeated my attempts to induce carbonation despite adding fresh yeast on several occasions (including some rehydrated champagne yeast). Luckily I recently purchased a carbonator cap which allows me to inject CO2 from my kegging system directly into any liquid (I used the same tool to carbonate an actual Angel's Share from that batch a couple months back). So over the course of the holiday weekend I set out to force carbonate and sample the three different versions (Plain, Brandy, and Bourbon) of my Liquor Spiked Barleywine The only drawback was that since the yeast never kicked in all three still contained short chain sugars I added for priming, as a result each came off a bit sweeter than I would have liked. The three versions of this beer were surprisingly different given that the only change was the presence of oak in secondary and a few tablespoons of liquor added during conditioning. 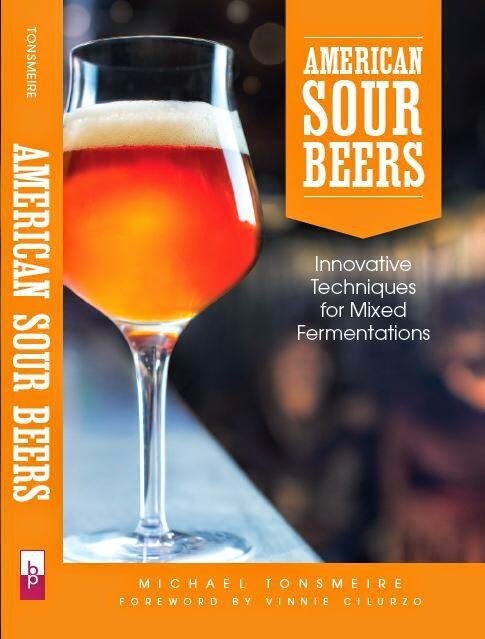 This turned out to be an interesting experiment and I think I'll be applying what I learned to brewing a massive liquor infused stout down the road. Appearance – Dark brown, with some amber at the bottom when held to the light. Thin off-white head fades pretty quickly leaving just a small ring of bubbles around the edges of the glass. 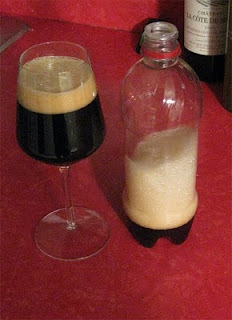 Not the best looking beer in the world due to a bit of haze (possibly from the violence of shaking CO2 into solution). Smell – Loads of dark fruit (dates especially), brown sugar, maybe a hint of butterscotch (caramel? ), and a whiff of sherry oxidation. Very complex aroma, balanced with no component dominating. Taste – Complex mix of dark fruit, toasted bread, and faint light roast coffee. There is a tad more sweetness than I was aiming for (most likely a result of the priming sugar that is still in there...), but still pretty well balanced by the remaining hop bitterness and the alcohol. I get a touch of leather in the finish that really adds a nice refined complexity. Very smooth for ~12.3% ABV, the year and a half of age have treated it well. Mouthfeel – Very nice slightly carbed, with a thick mouthfeel. The quick stop with the carbonator cap at 11 psi really made a big improvement on this one. Without some carbonation it was just too thin to be taken seriously as a barleywine (double brown, whatever). Drinkability & Notes – Good drinkability for such a big beer due to the high attenuation (83%). I only got 5 bottles from bottling this one, so I think there is only 1 left. I think it would be interesting for Lost Abbey to release their base beer for Angel's Share, much as Goose Island recently did with Night Stalker the base for their excellent Bourbon County Stout. Appearance – Same as the plain... brown, moderate-poor head, not a bad looking beer. Smell – The fruit character is decidedly more grapey (brandy grape, not Welch's), but with similar brown sugar tones. The butterscotch notes seem to be absent in this one, replaced with an oakier-vanilla tinged accent. Overall a less complex, more subdued aroma. Some ethanol as it warms, but restrained for a 12.5% beer. Taste – The grape and brown sugar from the aroma, with the addition of a bready backbone. The oak spice helps to counter some of the excess sweetness and gives this one great balance. The hop bitterness seems a bit more subdued than the plain. Mouthfeel – Feels a bit thinner than the plain, might be a function of tannins from the oak or a lower carbonation level since I did not let it sit as long. Drinkability & Notes – Maybe a bit less complex than the plain, but with a bit more drinkability. No where near the brandy character that Angel's Share has, but the brandy (cognac) is certainly present compared to the original. The small amount of oak and brandy really affected this one quite a bit, both positively and negatively. Appearance – Ditto on the appearance for this one, although the head retention seemed a bit worse than the other two. Smell – Surprisingly I get more roast in this one (comes across almost burnt), the alcohol is also more prevalent than in the other two. There is still the same dark fruit and brown sugar character, but it is more subdued than either of the other versions of this beer. Taste – The flavor has that distinct, bright, vanilla bourbon note. With the bourbon comes across more like a figgy-vanilla dessert rather than the more subtle savory flavors the brandy provided. The bitterness tastes much lower with some harsher alcohol notes taking its place. The brown sugar comes across as more syrupy, the balance is not as good. Mouthfeel – A bit thicker, but the carbonation is still just barley prickly. Drinkability & Notes – Not as drinkable as the other two variants, more aggressive. I don't care for this one nearly as much, the balance just isn't there. This is an odd one as I have added bourbon to several other batches in similar levels and not gotten the same flavors. Sounds delicious! 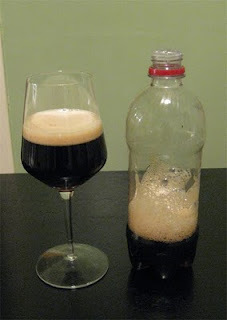 I have had the same problem with carbonation in fortified beers. I made a Jameson spiked irish red about a year ago that never carbonated despite its modest 7.5% alcohol. I wonder if there is some inhibitor of fermentation in most liquors, but I never researched it. I'm not surprised the Maker's Mark one had harsher alcohol notes to it. Maker's Mark is pretty harsh to begin with in comparison to a lot of decent whiskeys/bourbons I've had. I could see something like Knob Creek working well. It is a little more mellow, but still has a lot of character to it.